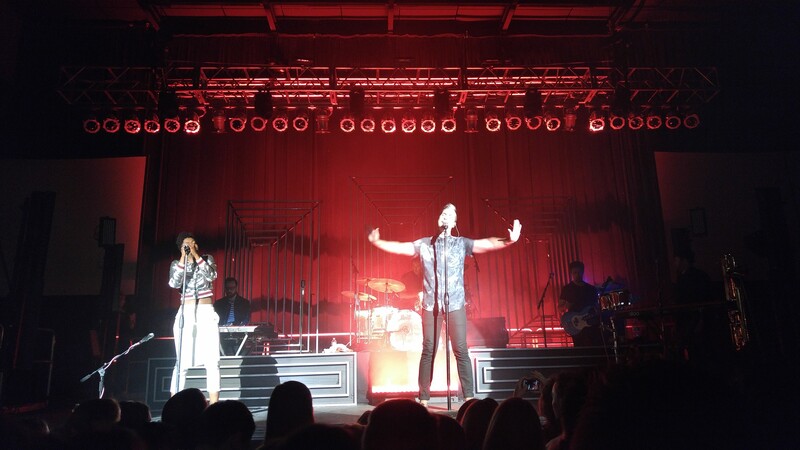 Fitz and The Tantrums put on a high-energy show on Tuesday at the Knitting Factory. The lights dim in the Knitting Factory and a drummer, a bassist, a saxophonist and a keyboard player take the stage. They set to work adjusting their instruments as the audience's volume raises. After a few moments of anticipation, the main foci arrive. Noelle Scaggs walks in from stage right, garbed in a shiny silver jacket and a half-skirt. Michael Fitzpatrick comes from stage left in a button up, jeans and polka-dotted shoes. 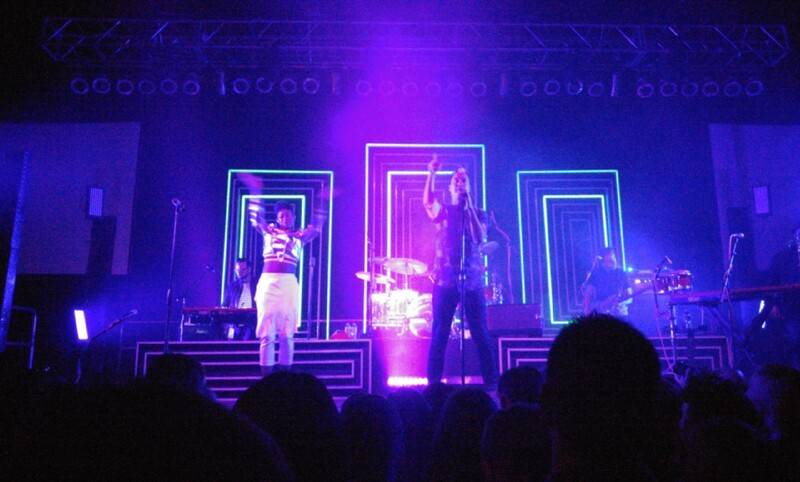 After a moment of smiling and waving, an acknowledgement of the audience's riotous cheers, the six-piece, the fully formed Fitz and The Tantrums, explodes into performance. The L.A.-formed indie-pop/soul group broke onto the scene in 2010 with the release of their debut album, Pickin' Up the Pieces. This June, the band released their self-titled third album, headlined by the infectious dance inducer "HandClap." The album, despite struggling through some critical scorn, has been a commercial success, peaking at number 17 on the Billboard 200. That success is obvious at the group's Knitting Factory show Tuesday, where a large, tightly-packed crowd on the floor interact excitedly with Scaggs and Fitzpatrick throughout the concert. Each time they're called upon to clap or sing along, they do so willingly and enthusiastically. All the while, a square-centric light show radiates behind the stage as the rest of the band jams along to back their two charismatic singers. The crowd is varied; a teenage girl behind me comments before the show starts that she wants to be close enough to the stage to "feel their sweat," while scattered 30- and 40-something couples head-bob contentedly on the floor. The bar area and balconies are crowded, too, and during the group's more danceable numbers — like "HandClap" and the band's breakthrough hit "MoneyGrabber" — even attendees in those sections of the venue get groovy and do some moving with the tunes. Despite this movement, the atmosphere is never mosh-like; the energy peaks somewhere around a "pleasant, mellow dance floor" level. Fitzpatrick and Scaggs take center stage, but the entire band showcases talent. The band's members are talented performers. Scaggs demands attention with her smooth, stylish moves and commanding vocal interjections, and saxophonist James King gets several fantastic spotlight solo moments. The 46-year-old Fitzpatrick does his best to keep up with Scaggs' swagger, but often looks stiff and awkward. Still, his vocal prowess and considerable, palpable desire to entertain his audience (highlighted by a few particularly cheer-worthy skips and jumps) mostly outshine his shortcomings. As the show progresses, the setlist cruises through the band's catalogue, keeping the energy high throughout. "Spark" and "Break the Walls" get plenty of hands in the air, "Out of My League" prompts much singing along, and a particularly memorable extended version of "L.O.V.," off the band's first album, closes out the main set in style with Fitzpatrick leaping excitedly back onstage after soaring sax and keyboard solos. The show culminates in a rendition of the band's biggest hit, "The Walker," whose expected presence at the show's end just makes its arrival more exciting. The tune translates brilliantly to a live setting, the bombastic breaks into its chorus highlighted impeccably by the bright light show behind the band. It closes the concert on a high note. Watching Fitz and the Tantrums perform live, one gets the sense that, despite any criticism they might receive, they'll follow their own advice and do what they want. That is, to give their fans a joyously good time — to make their hands clap.